The increased human control over the abstract condition of coldness and the thermodynamically determined functionality of cold materials to cool their surroundings has become an inseparable and in manifold ways interwoven feature of modern societies. This materializes in practices such as the (global) trade and consumption patterns of victuals, and the thermal control of spaces and industrial processes. This paper investigates the historical roots of infrastructural arrangements to control and convey coldness in an urban setting. It focuses on the spatio-temporal implications of cold infrastructures within the time perspective of the ‘ice age’, namely the decades around the turn of the nineteenth century when coldness was mediated through spontaneously and climatically becoming natural ice. In this article, I argue that ice based cold infrastructures created new territorial links between aquatic and terrestrial urbanity; shaped and extended new urban, layered and embodied cryospheric spaces; and created both lasting and fleeting temporal links from the past to the present and future. Coldness is a complex and intriguing quality and condition, with profound effects on, and relations with human lifeworlds. In 1626, Francis Bacon was preoccupied with the essence of coldness and underlined the difficulty of grasping coldness: ‘heat we have in readiness; but for cold we must stay ’til it cometh […] and when all is done, we cannot obtaine it in any great degree’ (Bacon, 1626: 68).1 Coldness as a negative abstraction and a privative (Croissant, 2014: 12) is defined as the absence of heat. More precisely, coldness is the lack of heating energy, i.e. the movement of particles, which humans sense as warmth/heat or observe through an array of mechanical detectors, such as thermometers. In addition to this definitional negation built-in, the essence of coldness is complicated through the thermodynamic rule, according to which thermal conduction occurs when two objects of different temperatures come into contact with each other, i.e. temperature differences strive to achieve an even balance. Thus, coldness is never a static condition, but in constant flux. Coldness is a tricky quality that in human history has been much more difficult to master than heat – the intentional production and maintenance of low temperatures has a much shorter history than its hot counterpart. James Beniger (1986, cited in Edwards et al., 2007) has termed the period from the first Industrial revolution to the present as the ‘control revolution’. It is characterized through increasing technological and organization changes within societies to manage ever-increasing flows of goods, services and information, and it materializes in inter alia the contemporary global mastering of low temperatures. This has resulted in networked systems of controlled coldness for the purposeful refrigeration of objects and spaces, creating a ‘coldscape’ (Twilley, 2012) that has become an indispensable part of modern life. The enhanced mastering of coldness is connected to the evolution of refrigeration technology which eventually has enabled the creation of global cold chains, revolutionizing food hygiene and preservation, our understandings of ‘freshness’ and an ordinary diet, and global commodity chains (Thevenot, 1979; Hård, 1994; Enbom, 1995; Freidberg, 2009; Finstad 2012; Rees, 2014; Jackson, 2015; Gantz, 2015; Finstad et al., 2015). Through the all-encompassing, mostly fossil-fuel based artificial refrigeration, the ‘development of systems for manufacturing and regulating cooled and frozen states [..is in..] the heart of global thermodynamics in the Anthropocene’ (Bravo, 2017: 43). This article explores these ice-based refrigeration systems using an urban environmental historical approach with a spatio-temporal emphasis on scrutiny. This approach accentuates the human motivation to control and manage the natural (cold) configuration of the Earth. It reveals the past of interwoven links between the biophysical and social complexities of coldness, manifested through transformations within a diverse set of sites and spaces, temporalities and ecologies of coldness. Here, I use the concept of infrastructure as a tool to investigate the creation of ice based networks of controlled coldness.3 Infrastructures evolve incrementally over time. In order to trace back early, ice based forms of cold infrastructures, an approach concentrating on fine scale infrastructures of municipalities is feasible (Doyle & Havlick, 2009). I place my investigation in the urban context, the ‘densest expression’ of a broad set of infrastructures (Ausubel & Herman, 1988: 1), of which the cold infrastructure is one. As an empirical backdrop for the examination of the emergence of an urban coldscape and the ice based cold infrastructure on the local level, I use the Finnish capital city, Helsinki. While being a city at the 61st parallel, with yearly mean temperatures between approximately 2–7 ºC, the region experiences a ‘short but amazingly hot summer’ (David, 1994: 295).4 Since roughly the 1850s onwards, the issue of cooling was increasingly woven into the urban experience of the city. The emergence of early stage cold infrastructures in Helsinki took place in parallel with the transformation of the previously small and backward village into the administrative, commercial and industrial center of the country by the latter half of the century. The emerging urban need and desire for coldness was based on several developments related to the rapid urbanization of Helsinki. Enhanced demands for cooling became evident in the form of new, emerging hygienic ideals of food production, preservation, and transportation over increasing distances, and new urban lifestyles where leisure was connected with thermal pleasures such as cooled drinks and ice cream (Urbans, 1961; Lepistö, 1994; Hentilä, 1999). Sporadic historical evidence about unregulated ice harvest for the predominantly spontaneous self-sufficiency of small enterprises, such as breweries, and institutions like hospitals, can be traced back to the early 19th century (Helsinki Health Board, 1935b). 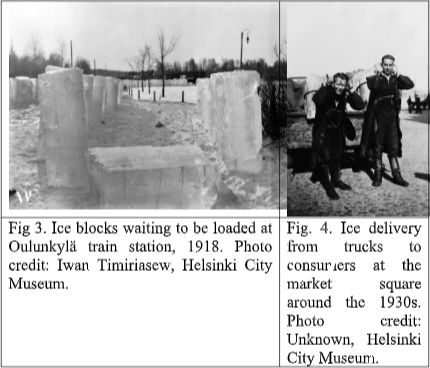 However, only the commercialized mode of natural ice trade and the related regulation by the city authorities provide documentation that reaches to the last decades of the 19th century and thus offer more insight into the historical emergence of cold infrastructures in Helsinki. The article proceeds with an elaboration of the key concept of cold infrastructure, after which the history of organizing ice based urban cooling in 19th and 20th century Helsinki is discussed. The study adds insights into the often neglected history of frozen urban environments, and provides reflections especially into the spatial, temporal and ecological implications of urban coldness during the ‘ice age’ of refrigeration. In its broadest sense, infrastructure is understood as any essentially important, widely shared, human constructed resource that provides the basic facilities, services and installations needed for the functioning of a community or society (Edwards, 2003: 187). Infrastructure as a word dates back to the 1870s and is derived from its French origin, meaning the construction material that lies underneath railroad tracks. This background explains also why it was for a long time understood as mainly the material artefacts related to the respective functional purposes. Later the word was extended into a concept encompassing a wide set of technical and organizational networks (Gandy, 2014: 2). In the dominant chorus of literature, the main task of infrastructural systems is to control natural processes and extract natural resources and convey them over distances for human benefit (Doyle & Havick, 2009). Human dependence on natural resources is managed through the infrastructures that regulate different kinds of fluxes and material flows (Tarr, 2002; Kaika, 2005). The increase of human material well-being in western societies has been assigned to the development of vital infrastructural systems. Hence, the building of urban infrastructures for the provision of ‘shelter, contact, energy, water, and means to meet other human needs’ (Ausubel & Herman, 1988: 1) has been celebrated as one of the most fundamental manifestations and pronounced icons of modern urbanism, vitality of urban regions, prosperity and welfare (Graham & Marvin, 2001: 44). The dominant stance of infrastructures as mainly technological has been challenged lately and the scopes of scholarly literature, and disciplinary variation of vantage points to analyze infrastructures have diversified vastly during the last few decades (e.g. Larkin, 2013). One powerfully emerging branch of literature emphasizes the inseparable connection of infrastructures to the non-human, natural world and highlights the environmental underpinnings of infrastructures and the underlying biophysical realities. While the idea of natural components as infrastructural system artefacts is not new (see Hughes, 1989: 51), recent approaches have specifically attempted to restore the connection of infrastructures to the biophysical landscape and incorporate nature in infrastructure, even perceiving nature as infrastructure (Carse, 2014; Rosenberg, 2015; Bélanger, 2017). According to Graham and Marvin (2001: 8) modern urbanism is a process constituting of fluxes through several superimposed, contested and interconnecting infrastructural landscapes that provide the mediators between nature, culture and the production of the city. Different kinds of ’polises’ are formed through infrastructural ’scapes’ that are inseparable from and interrelated with urban development and urban space. Following this principle, this study takes as a starting point the cryopolis, the ice city, where natural ice is the key component in the emergence of an urban coldscape (Twilley 2012). The coldscape is an infrastructure that comprises of a constellation of social and technical systems that stabilizes otherwise ephemeral and dynamic materials such that they can circulate, producing nutrition, comfort, health and knowledge (Twilley, 2012; Radin & Kowal 2017: 5). An ambiguous relationship emerges through the functional characteristic of infrastructures as creators of stability (Edwards, 2003), and the cryospheric materiality, ‘stable in neither time nor space’ (Gerhardt et al., 2010: 994). Ice is characterized as a ‘liminal substance that combines and confuses’ the properties of land and water (Gerhardt et al., 2010: 993–994) and the temporalities of ice formation, movement and melting hide or complicate ideal notions of permanence and stability, often connected to the very nature of infrastructures (Bravo, 2017: 48). Human engagements with the natural world are spaced, timed and embodied (Franklin, 2002). Within the urban environ-mental historical angle of this study, the analysis emphasizes the spatio-temporal dimensions of the expanding cryopolis and the emerging cold infrastructures. It is based on the conception of lefebvrian perceived space, understood as the biophysical and ecological materialities of coldness. While nature is the ‘raw material’ from which these spaces are produced, the cryopolis comprises also of e.g. economic and technical realms that shape the materialities under scrutiny (Lefebvre 1991 : 84). It consists of multiple layers of urban spatialities that are substantially co-producing various urban spaces in dynamic and contextually bound processes (e.g. Lefebvre, 1991 ; Smith, 1984; Soja, 1996).5 Understanding the perceived space necessitates also the consideration of the sensorial dimensions of physical space and the investigation of the practical and sensory activities that contribute to the production of these spaces. Physical materialities are observed through the human senses and as will be shown, apart from the intuitive visual and haptic aspects of urban cold infrastructure, the unfolding of the cryopolis highlights also the so far very scarcely studied thermoceptic dimensions as an integral part of the human engagements with ice. Closely connected with the spatial aspects are the various temporalities of the cryopolis. While physical space is directly conceivable through the senses, time is a human construct that can have content and an orientation towards the past or the future only through human language (Lehmkuhl, 2007). Thus, the concrete and abstract, human and non-human come in a unique way together in human dealings with ice. While a common conception of time is characterized through linearity, the human interactions with their cryospheric environments challenge this notion, as human time differs and is sometimes even opposed to the times, processes and rhythms of the natural world (Macnagthen & Urry, 1998). Simultaneous co-existence of several temporalities become evident through the thermodynamic particularities of phase changes of water, the cyclical seasonality with particularly climatically determined conditions, and yet constantly fluctuating weather conditions, and the man-made technological constructs of the cold infrastructure. Thus, times of nature get fused with times of human actions, needs, and senses. Together they contribute to a more complex conception of time. The spatial and temporal aspects are inseparably intertwined in the ice based cold infrastructure, showing both fleeting and persistent material manifestations that constitute the essence of the lefebvrian perceived space of the emerging cryopolis. There exists not one entity of urban waters, but two. The typical urban waters, rivers, ponds, lakes and seas adjoining cities, do have another appearance with a variety of functional, ecological, economic, social and cultural features when in the frozen state (cf. Laakkonen, 1997). Due to seasonality and climatic conditions of the northern regions of the planet, the urban waters, the ‘urban blue’ turns into the ‘urban white’ during winters. Frozen waterways have been important transportation routes along coasts, and inland waters, and they provide access to otherwise inaccessible islands.6 Moreover, they are significant and large, urban recreational spaces offering nearby and easy accessible opportunities for skiing, skating and other outdoor activities. The city of Helsinki is naturally surrounded by freezing waters. Central Helsinki is located on a peninsula jutting into the Gulf of Finland, where also the non-navigable River Vantaa drains eight kilometers from the city center. On average and until recently these waters freeze in November with the ice sheet at its thickest at the end of February. Ice loss occurs usually in April. The main sources of natural ice in Helsinki were the brackish Baltic Sea with a very low salinity in the shallow bays surrounding the city, and the more valuable fresh water ice from River Vantaa. The river is effectively cut off from contact with saline water since there are no tides in the Baltic Sea, and through rapids with a six-meter altitude difference at the river mouth (Fig. 1). The harvesting areas of river ice concentrated, firstly, in the immediate vicinity of the rapids, where the river is at its widest. In the district around the river mouth there was a fishermen’s community that was employed in the ice business during winter. The region developed into a central hub of the local ice industry and during harvesting time most of the river was leased for ice acquisition (W.-I., 1933). Another important area for the acquisition of river ice was located approximately 2.5 km upstream, where the river crosses the main railway connection, which was opened for traffic in 1862. The geographic location of the city ensured ample local sources of natural ice and the territorial extent of ice harvest and distribution in the capital normally was with a less than 15 km radius. Only during a few exceptional years did ice traders transport their product from lakes farther away (e.g. Helsinki Health Board, 1935a). From the inner city main consumers’ view point, however, the sites for ice harvesting, were peripheral outskirts of the city (W.-I., 1933). Fig 1. The main locations of ice harvesting in the city of Helsinki, Finland. Source: Compiled from the ice harvesters’ written applications to the city authorities for leasing ice fields. The acquisition of ice was concentrated in a time period typically in February-March, when ice formation had reached a minimum thickness of 25–30 cm. Using the applications of individual harvesters as a guide, the city authorities indicated designated spots to be used as ice fields. Men with their long, specially designed saws entered a short, but intensive period of cutting ice. During years with advantageous weather conditions, one or even two more consecutive harvests could be made later in spring (W.-I., 1933). It has been identified that landscapes and nature as infrastructure include great potential for conflicts (Edwards, et al., 2007; Carse, 2014). The abundance of cryospheric coverage in the city allowed for an unproblematic co-existence of several uses of ice. Concerns were raised mainly in relation to the safety of recreation around the ice harvesting fields and the open waters amidst the ice. As a solution, the lease permits for ice fields included a stipulation about the careful marking of the fields with branches (Helsinki City Government, 1957; ice field lease contracts, e.g. Helsinki Chamber of Finance, 1926). In addition, a conflict of interest was related to the water intake of the city’s Water Works close to the ice fields. The abovementioned requirement to mark the actively used ice fields with branches for passenger safety meant that at the time of spring thawing the floating branches could destroy constructions at the water intake, or foul the water quality near the intake (Helsinki Chamber of Finances, 1909). Additionally, when tractors were used instead of horse power in the ice fields for lifting the heavy ice cubes from the water, incidents were reported of tractors falling through the ice into the River Vantaa. The accidents caused oil spills that threatened the raw water resource of the city (Wikman, 1965). The potential hazards to water supply was minimized by requiring the removal of the marking and fencing material before ice loss, and the prohibition of motor vehicles on the ice (Helsinki City Government, 1957; Wikman, 1965; see also e.g. Helsinki Chamber of Finances, 1927). Within the alternative uses of the ice covered waters, water security was clearly prioritized over the ice take. However, since the realization of the threats was unlikely and accidents rare events, the potential conflicting infrastructural uses of cryospheric landscapes was solved through relatively simple managerial measures. The ice covered surfaces, the public and widely accessible layer of the cryopolis, were separated into spaces of specialized functions (Lefebvre 1991 , 97–98; 155–156), and the origin of the cold infrastructure, the homogenous ‘raw material’ was entering an intermediate phase of storing and preserving coldness. While uncontrollable weather conditions defined the initial formation of ice, the incorporation of ice into the production and distribution of coldness required a high degree of control of the flows and fluxes related to the material ice in itself, and the coldness it mediated. Rectangular blocks of ice were cut and floated in the ice field, after which they were lifted to the shores either on horse drawn sledges, or with help of winches (Nääppä, 1997; W-l., 1933; Jokinen, 1976). The heavy physical human work integral to the cold infrastructure was performed in harsh environmental conditions of sub-zero temperatures, with and on solid ice and ice-cold water (Fig. 2). Apart from the concrete handling of slippery ice chunks, the thermoceptic dimension was intimately present in the practices of the cold infrastructure. ‘Sometimes the sawyer slips, and ends up in a cold bath’ (Wikman, 1965). Naturally frozen water turned into a detached object, whose function was to conceal the coldness in it, until it was utilized in another place, at another time. Eventually, the ice based cold infrastructure was composed of alternating static and mobile phases of the ice. These are discussed separately in the following sections. Fig. 2. Ice cutting 1920s-1930s. Photo credit: Kalle Havas, Helsinki City Museum. The solid and sedentary ice cover of waters formed a natural cryospheric landscape. Through harvesting, it was transformed into bulky and slippery chunks that could be traded in the monetized system of resource markets. The point of time of ice acquisition and main period of demand differed crucially based on climatically determined variation of the seasons and most importantly, outdoor temperature. On the other hand, the places of initial formation of ice, intermediate storage, and final places of utilization spread across the entire city. Thus, the cold infrastructure turned natural ice into a commodity to be moved across time and space. The different modes of conveyance of ice from its origin to the temporary storage, and eventually to the end users connected the cold infrastructure seamlessly to transportation networks. Essentially, ‘infrastructures are matter that enable the movement of other matter’ (Larkin, 2013: 329). During the early phases horse drawn sledges were the most important transportation utility in winter times. The novelist Tito Colliander memorized the ice sledges that at walking pace passed through his childhood neighborhood as engrossing. He could see in them the ’inner essence of frozenness’ – the colourful spectres in the ice when the sun shone through them, and the origin of ice in ’another, secret world’ (Colliander, 1967: 165–166). The mobilities of ice fused two worlds, the cryospheric nature, and the everyday chores of urban life in a visually extraordinary way. The largest enterprise of the 19th century ice trade, the mineral water company of the Hartwall family (Mineralvattenfabriks A.B. Aug. Ludv. Hartwall Kivennäisvesitehdas O.Y.) utilized also barges to transport its ice from the peripheral harvesting sites to downtown pitches. These ’floating ice cellars’ were handy during summer, allowing anchoring in downtown and selling the ice directly from the barge (Anonymous, 1889b). Following the continuous, rapid increase in the ice trade, also railway transportation became an economic way to convey larger amounts of ice. By the turn of the century, the Hartwall company pleaded successfully to the National Board of Railways for an extension of the existing circular central railway. This new track enabled a direct and smooth connection from sites of supply to sites of demand. The new track linked their harvesting area at River Vantaa, which was located close to the Oulunkylä railway station (see Fig. 3), to another newly acquired downtown storage site (Anonymous, 1901). The connection to rail transport amplified the magnitude of the cold resource and added another link between the cold and the transportation infrastructures. Finally, along with the motorization of transportation in general, trucks became the agile vehicles to ensure the mobility of ice. The final delivery was, performed by men, who daily during high season carried tons of ice to the end users on their backs. The bodily and thermo-sensorial dimension of this work is highlighted through the protective leather capes they wore in order to diminish the sense of coldness necessarily related to this recurrent touch with ice. Thus, the cold infrastructure based on natural ice embodied human work and the thermal mediation work of ice that overlapped in fleeting moments and sites (Nääppä, 1997; Fig 4.; see also Larkin, 2003: 337). The conveyance of ice across the city combining several interconnected modes of mobility created temporary transitional spaces, which are also required for the working of the cold infrastructure. In addition to (cold) spaces that are produced through energy fluxes, also spatialities of cold production infrastructures are significant (cf. Huber & McCarthy, 2017). The apparently static condition of the ice cut with precision into regular and predetermined shapes, fluctuated with detached ice as labile matter in a constant thermodynamically conditioned flux. As part of its functionality of absorbing heat and releasing the coldness to the surrounding medium, ice liquefies, and its characteristic materiality transformed. As a final stage of the cold infrastructure ice is seamlessly connected to urban water circulation. Thus, the spatialities of coldness are tightly connected to the thermal flows which are enabled through the functionality of infrastructure to convey resources over spaces (Edwards, 2003: 188). Coldness, as such invisible to people, materialized in the ice, and through the infrastructural arrangements that allowed the distribution and functioning of this ice. The extensive temporal lag between harvesting, and the end use of ice necessitated between the mobile phases of conveying coldness also extensive, static periods of storage. After the ice blocks had been detached from the ice fields, they were transported for storage in various kinds of facilities. Vacant space close to harvesting areas were often used for storage. River banks out of town were favored spots where ice traders could lease land from the city for this purpose (e.g. Helsinki Board of Properties, 1934). During summer time, these ‘ice bergs’ at the river banks were a constant reminder of the past winter for the locals gathering at the river for leisure (Anonymous, 1936). The temporal mediation between seasons was repeatedly articulated in newspapers reporting on ice issues. The forthcoming summer and its heat motivated the work during winter. In the 1952 Olympic year the ice harvesters were worried about sufficient ice for the ‘sweating citizens and their guests in the heat’ (Anonymous, 1952). Reciprocally, in summer the handling of ice reminded of the winter as the origins of the cold (Anonymous, 1936). The ability to preserve ice over the seasons, and thus enable people to cool indoor spaces for hygienic preservation and products for thermal comfort and pleasure, shows how cold infrastructures allow humans to control both time and space (Edwards, 2003: 189). The most common way of storage was an open-air battery of ice. Fenced with very functional, but not very attractive bare boarding, the ice blocks were piled into tight batches, yet exposed to changing weather conditions. The privative character of coldness turns the infrastructure into a system, whose purpose is to manage and control the fluxes of thermal energy. To prevent the undesired fluxes happening in either in wrong places or at wrong times, it was crucial to develop practices of insulation. The generation of coldness requires the prevention of heat. Thus, the open-air piles were covered preferably with sawdust for best insulation and protection (Holmlund, 2003). In the Finnish context, indoor spaces for the storage of large deposits of ice were more uncommon.7 Individual ice using facilities and enterprises, such as breweries, hospitals and restaurants, had their own subsurface ice cellars incorporated in their premises. However, the large amount of space required to store the bulky ice at inner city premises was becoming increasingly inconvenient (Manner, 1936: 364, 366). At times of scarcity even the construction of ice cellars was considered a major investment, which was not necessarily prioritized. For instance, during the planning and construction of a new communal poorhouse and workhouse in 1911, the request of the officials for an ice cellar was declined because of the expense which was considered too high. Because suitable, ‘nearby shady places’ for an ordinary ice pile existed, a special construction for ice storage was declared unnecessary (Helsinki Chamber of Finances, 1911). The only records of an ice house construction refer to the facility of the Hartwall company. The company had their first open air ice deposit, with the modest capacity to store some thousand ice chunks in the north-eastern district of the city, half-way between their main ice harvesting areas close to the mouth of River Vantaa, and the city center. The flourishing of ice business led them to extend and improve their storage facilities, and in 1889 a modern ice house with three-fold capacity was built at the River Vantaa mouth (Fig. 5). The rareness of that kind of facility was highlighted during the inauguration of the ice house, which developed into a media event with details about the working of the facility reported in the newspapers (Anonymous, 1889a; Anonymous, 1889b). The various kinds of storage facilities produced a vertically layered urban fabric reaching the ground, semi-beneath it, or into entirely sub-surface spaces. The storage displaced and scattered the cryospheric domain all over the city, from peripheral plots to immediate vicinity of end users in ice cellars (Fig. 6). The preference for sheltered spaces is common besides for thermal control, also to facilities connected to the military sphere. Thus, ice storage facilities, and military constructions were reciprocally utilized. Parts of the former ice cellar of the officers building in the islandic fortress Suomenlinna were transformed during the 1930s into air shelters (Suomenlinnan jääkellari, 2017). On the other hand, one ice dealer established his ice storage in an unfinished military bunker, whose construction had been started as part of the fortification efforts during WWI, and which then was abandoned. The pit offered a ready-made shady and protected spot for the ice (Holmlund, 2003). Thus, the landscape, shaped by remnants of military arrangements was transformed into parts of the cold infrastructure. The storage facilities of ice retain an absorbing duality. Ice houses and cellars were the most persistent and visually detectable constructs of ice infrastructures. Today, they are the largest, and most significant still existing industrial archeological remnants of the ice age of controlled coldness (Lütgert, 2000). However, due to requirements of insulation of the ice, they were preferably located in shady, protected, and insular sites with as little human access or engagement as possible. ‘Thousands of citizens spending summer time at the river notice the ice, even though this cooling substance was not in sight, but stayed carefully hidden from the warming rays of the sun’ (Anonymous, 1936: 1–2). The very material storage of coldness in the extensive and scattered facilities was hidden, covered and invisible, but at the same time, it produced new urban spaces that became the epitome of urban coldness. While only a few ice cellars have survived, through novel uses as cafés and rental premises for events, they have remained in active use and part of the lively urban fabric. Fig 5. The (on the left) ice house of the Hartwall company in 1900. The blind walls enabled maximum insulation to preserve the cold over time. The building does not exist anymore. Photo credit: C. Hausen, Helsinki City Museum. Fig. 6 Former ice cellar of an urban villa, Helsinki 1963. Photo credit: Constantin Grünberg, Helsinki City Museum. Refrigeration based on natural ice was an emerging cooling system of most importantly the 19th century, and a forerunner of a full-fleshed, mature cold infrastructure that was based on mechanical production of coldness, extensive networks of energy production and distribution and a food provisioning system that relied on effective cold chains. Investigation of ice based refrigeration helps to increase our understanding of the spatio-temporal characteristics of the evolving urban cold infrastructure. It emerged as a hybrid of inherently natural and uncontrollable processes, and man-made arrangements to maximize the utilization of them. The natural process of freezing, the physical properties of ice through the high specific heat capacity and thus, the ability of containing coldness in a material form merged with human constructions of conveying and storing of that coldness across space and time and the controlled releasing of it for human benefit. Together they formed a networked, infrastructural system for creating and controlling coldness in an urban context. The environmental dimension of infrastructures highlights the dualistic relation between the natural environment and the infrastructures that depend on it. Infrastructures contain a stability function that aims to provide systemic and society-wide control over the variability inherent in the natural environment. On the other hand, infrastructures ‘work’ only within a certain range of natural variability (Edwards, 2003: 189–193). Weather conditions regulated and constrained ice harvest. Through ice humans aimed for thermal control of spaces, irrespectively of the temporal variability of naturally occurring thermal conditions. Thus, the control of (low) temperatures through ice detached coldness from seasonality. Coldness that had been a natural condition, escaping human control, was through ice now available at times of human choice and at sites prepared and managed by humans. These practices of controlling coldness enabled turning it into a ‘cooperative commodity’8 that eventually could be managed at industrial scales. The incorporation of ice in the cold infrastructure transforms it from a natural condition of water in its solid state first to a resource and finally into a commodity with monetary value. At the same time, the practices and arrangements that enabled a functioning cold infrastructure, created temporal links from the past to the present and into the future. Besides a mediator of coldness, ice became a mediator of time. Ice based cooling grew during its heyday as an increasingly networked system with several other kinds of connecting properties.9 Infrastructures have been conceptualized as territorial, where the conveying of resources binds urban and rural effectively together. These ‘paths out of town’ mediate the relationships of landscapes across space (Carse, 2014: 15). Also, local ice based urban cold infrastructures created new territorial links between periphery and urbanity. The urban coldscape comprised of natural cryospheric landscapes of the periphery and intermediate, vertically layered spaces co-constructed through regular, detached and displaced, mobile and static ice, and which became a materialization of coldness in the cityscape. The different material components and spatial relations of the cold infrastructure establish a multiply layered cryopolis. The extraction of ice in the public, urban water bodies was the origin of the cold resource. The circulation of ice in an intermediate, networked system of routes and mobilities of ice expanded the spatial realm of the layered cryopolis. Finally, through the storage of ice in visible, yet hidden deposits, ice occupies urban sites and creates a layer of private, cryospheric spaces (for the three level distinction of spaces, see Lefebvre 1991 : 155). The investigation of the cold infrastructure reveals the sensory dimensions of perceived spaces of the urban. The sensory perception of the cryopolis unfolds above all through the visual appearance of ices as part of the urban fabric, the haptic contact with the physical materiality of solid water, and the subjective, thermoceptic sense of coldness. Taken together, through this sensory dimension, the embodied nature of human interactions with the urban coldscapes and the ice based cold infrastructure becomes evident. The ice based cold infrastructure that enabled the emerging cryopolis was transitional and contested several boundaries. It bridged the traditional dualism of separated aquatic and terrestrial environments through the liminal characteristics that frozen waters create between these domains (Gerhardt et al., 2010). The thermodynamic basis of the cold infrastructure operated with the fluctuating timings of phase changes of water, between solid and fluid. The urban, ice based cold infrastructure is also characterized through alternation between stagnant stages (storage) and mobility between locations. The handling and preparation of ice for cooling purposes created and shaped new vertically layered, cryospheric spaces and thus widened the extent of the cryospheric realm in an urban context. The analysis of the material spatiality of urban ice based cold infrastructures reveals a cryopolis that crosses between the visible and invisible domains of urban space (cp. Gandy, 2014: 1). The broadly shared premise of environmental historical inquiry, stating on the one hand, a two-way human-nature interaction including humans shaping the world, and on other hand the formative power of natural forces to influence human action, is powerfully present in the investigation of ice based coldness (cp. Mauch & Zeller, 2008: 7). Despite the recent scholarly attention to ‘cryohistories’ (Sörlin, 2015), their focus has widely neglected the urban (Smedley & Wickham 2017). In the context of current indications of unprecedented anthropogenic climatic change and the following consequences to cryospheric realities also in cities, this study aims to highlight the significance of the historical roots of the cryopolis while contributing to its investigation. For a lengthier discussion on coldness, see pp. 68–87. In Helsinki, the recorded natural ice harvesting ended in 1959. Strictly, the classification of ice based cooling as an infrastructure can be questioned, since widely accepted definitions of infrastructure presume a consolidated, and networked organization of systems, which during the ‘ice age’ of refrigeration are still in a stage of local and site specific system building. It can be argued that they evolved into a mature infrastructure only with the shift to electrically produced coldness (Edwards et al., 2007, see especially the summary, p. 12). However, it provides the basis for the future amplification of the networked system of coldness into an infrastructure. For the purpose of this study, the insights of infrastructures benefit the analysis of the early stage of cold creation and delivery. The quote refers to a 19th century observer in the climatically very similar St Petersburg, which is located 186 miles/ 300 km east of Helsinki. Influenced by the writings of Henri Lefevbre (especially, 1974), the idea of a multiplicity of different kinds of spatialities is widely accepted. The analysis of cryospheric environments as imagined and lived spaces as discussed by e.g. Soja (1996) is a compelling task for the future, however, it is beyond the scope of this limited study. While earlier the greatest advantage of transportation on ice was based on the scarce and poorly maintained road connections of often dubious quality, at present ice roads’ main benefit is the creation of shortcut across waterways and decreased distances. In this aspect, the northern countries differ from other locations, where ice houses have been attributed to have besides their storage functionality, ornamental and architectural features, see Lütgert (2000). The notion refers to Karen Bakker (2004), who has convincingly argued how water is due to its specific characteristics an uncooperative commodity. The observation of ice as a spatio-temporally connecting substance broadens the dominant narrative of (sea) ice surrounding the city being a physical and mental barrier to communication and trade, thus underscoring its disconnecting properties (Laakkonen, 1997). Anonymous (1889a) ‘Paljon jäätä’, Suomen Wirallinen Lehti (25 Jan 1889, p. 2). Anonymous (1889b) Untitled report Kaiku (29 Jan 1889, p. 2). Anonymous (1901) ’Raide jäävarastolle’, Päivälehti (12 Oct 1901, p. 2). Anonymous (1936) ‘Vantaalla jäännostot jälleen täydessä käynnissä’, Suomen Sosiaalidemokraatti (28 Feb 1936, p. 1–2). Anonymous (1952) ’Jäännostajat toivovat hartaasti pakkasia’ Ilta-Sanomat (9 Feb 1952, p. 8). Ausubel, J. & Herman, R. (1988) Cities and their vital systems: infrastructure past, present, and future. National Academy Press, Washington, D.C. 1 online resource. Bacon, F. (1626) Sylva Sylvarvm or A Natvrall History In ten Centuries. Published after the Authors Death by W. Rawley. London, UK. Electronic version from the University of Oxford Text Archive http://tei.it.ox.ac.uk/tcp/Texts-HTML/free/A01/A01552.html Retrieved 29 May, 2017. Bakker, K. (2004) An Uncooperative Commodity: Privatizing Water in England and Wales. Oxford Geographical and Environmental Studies Series: Oxford University Press. Beniger, J. R. (1986) The Control Revolution: Technological and Economic Origins of the Information Society. Cambridge, MA: Harvard University Press. Board of Public Property, (1959) Kiinteistölautakunta, maatalous- ja metsäosasto, Minutes of meeting (25 Mar 1959, 10§). Bravo, M. (2017) ‘A Cryopolitics to Reclaim our Frozen Material States’, in J. Radin & E. Kowal, (eds), Cryopolitics; Frozen Life in a Melting World. Cambridge, Mass. and London: MIT Press, 27–58. Carse, A. (2012) ‘Nature as infrastructure: Making and managing the Panama canal watershed’, Social Studies of Science 42(4): 539–563. Carse, A. (2014) Beyond the Big Ditch: Politics, Ecology, and Infrastructure at the Panama Canal. Cambridge, Mass. : MIT Press. Colliander, T. (1964) Bevarat. Helsingfors: Schildt. Croissant, J. L. (2014) ‘Agnotology: Ignorance and absence or towards a sociology of things that Aren’t there’, Social Epistemology 28(1): 4–25. David, E. (1994) Harvest of the Cold Months: The Social History of Ice and Ices. London: Michael Joseph Ltd.
David, R. G. (2000) ‘The ice trade and the Northern Economy, 1840–1914’, Northern History 36(1): 113–127. Doyle, M. & Havick, D. G. (2009) ‘Infrastructure and the environment’, Annual Review of Environment and Resources 34: 349–373. Edwards, P., Jackson S., Bowker, G. & Knobel, C., (2007) Understanding Infrastructure Report of a Workshop on ‘History & Theory of Infrastructure: Lessons for New Scientific Cyberinfrastructures’, January 2007. Available at: https://deepblue.lib.umich.edu/bitstream/handle/2027.42/49353/UnderstandingInfrastructure2007.pdf?sequence=3&isAllowed=y Retrieved 26 October, 2017. Edwards, P. N. (2003) ‘Infrastructure and Modernity: Force, time and social organization in the history of sociotechnical systems’ in P. Brey, et al., (eds), Modernity and technology. Cambridge, MA: MIT Press, 185-226. Enbom, S. 1995. Kylmän välttämättömyys: kylmätekniikan voitonmarssi Suomessa [The need for cold: historical perspectives on Finnish refrigeration technology]. Helsinki: Suomen kylmäyhdistys. Finstad, T. (2012) ‘Cool alliances: Freezers, frozen fish and the shaping of industry-retail relations in Norway 1950–1960’, in R. Jessen & L. Langer (eds), Transformations of Retailing in Europe after 1945. Surrey: Ashgate Publishing, 195–210. Finstad, T., Kvaal, S. & Østby, P. (2015) ‘Tackling Norwegian cold: The breakthrough of home freezing’, in P. Lundin & T. Kaiserfeld (eds), The Making of European Consumption: Facing the American Challenge. London, UK: Palgrave Macmillan, 89–110. Franklin, A. (2002) Nature and Social Theory. London: Sage, online resource. Freidberg, S. (2009) Fresh: A Perishable History. Cambridge, Mass. : Belknap Press of Harvard University Press, E-book. Gandy, M. (2014) The Fabric of Space: Water, Modernity, and the Urban Imagination. Cambridge, Mass. : MIT Press. Gantz, C. (2015) Refrigeration: A History. Jefferson: McFarland & Company Inc Publishers, online resource. Gerhardt, H., Steinberg, P. E., Tasch, J., Fabiano, S. J. & Shields, R. (2010) ‘Contested sovereignty in a changing Arctic’, Annals of the Association of American Geographers 100(4): 992–1002. Graham, S. & Marvin, S. (2001) Splintering Urbanism: Networked Infrastructures, Technological Mobilities and the Urban Condition. London: Routledge. Helsinki Board of Properties (1934) Helsingin kaupungin kiinteistölautakunnan pöytäkirjat [Board of properties, Minutes of meeting] 22 Oct 1934, Ca:4, 1182§. Helsinki Chamber if Finances (1909) Rahatoimikamarin pöytäkirjat liitteineen [Chamber of Finances, Minutes of meeting] 21 Oct 1909, Ca:70, 37§, Micro card 1258. Helsinki Chamber of Finances (1911) ‘Esitys uuden asuinpaviljongin ynnä erinäisten muiden uutisrakennusten teettämisestä Forsbyn uuteen Työ- ja Vaivaistaloon.’ Helsingin Rahatoimikamari. Marrask 16 p:nä 1911 Helsingin kaupunginvaltuustolle, N:o 644, liitteet I–III’, (HKPA N:o 41). [Proposal (n:o 644) of the construction of some buildings to the Forsby work- and poorhouse, made by the City Chamber of Finances on 16 Nov 1911, Appendices I–III, in the Written documents of the City Council of Helsinki 1911, N:o 41]. Helsinki Chamber of Finances (1926) Rahatoimikamarin jaoston pöytäkirja [Chamber of Finances, Division Minutes of Meeting], 24 Feb 1926, Cc:7, 3072§. Rkmrin jaoston pöytäkirjan liitteet 1926, Cd:19, Liite 1/3072§). Helsinki Chamber of Finances (1927) Rahatoimikamarin jaoston pöytäkirja [Chamber of Finances, Division Minutes of Meeting], 30 Nov 1927, Cc:8, 7066§. Helsinki Health Board (1935a) Terveydenhoitolautakunnan pöytäkirja [Health Board, Minutes of meeting] 17 Jan. 1935, Ca: 58/ 17 Jan 1935/ 35§, Appendix 14, Letter from Johan Martikainen to the Health Board, dated 15 Jan 1935. Helsinki Health Board (1935b) Minutes of the Board meeting (14 Feb. 1935), Ca:58/14 Feb. 1935/32 §, Appendices 1 and 2, HCA. Hentilä, M. (1999) Keikkavaaka ja kousikka: kaupan työ ja tekijät 1800-luvulta itsepalveluaikaan. Helsinki: Liikealan ammattiliitto. Holmlund, B. (2003) Eiran Jää – Eira Is Vantaanjoella. [Stories from Oulunkylä, on-going oral history collection]. Accessed March 18, 2019. http://kaupunginosat. net/oulunkyla/historia/eiran_jaa_s.htm. Huber, M. T. & McCarthy, J. (2017) ‘Beyond the subterranean energy regime? Fuel, land use and the production of space’. Transactions of the Institute of British Geographers 42(4): 655–668. Hård, M. (1994) Machines are Frozen Spirit: The Scientification of Refrigeration and Brewing in the 19th century– a Weberian interpretation. Frankfurt: Campus Verlag. Jackson, T. (2015) Chilled: How Refrigeration Changed the World and Might Do So Again. New York: Bloomsbury Sigma. Jokinen, A. (1976) ‘Viimeiset jäännostajat’, Helsingin Sanomat (27 March 1976, p. 15). Kaika, M. (2005) City of Flows: Modernity, Nature, and the City. New York: Routledge. Laakkonen, S. (1997) ‘Jäätyneet kaupungit’, Historiallinen Aikakauskirja 95(3): 217–226. Larkin, B. (2013) ‘The politics and poetics of infrastructure’, Annual Review of Anthropology 42(1): 327–343. doi: 10.1146/annurev-anthro-092412-155522. Lefebvre, H. 1991 . The Production of Space. Translation by Nicholson-Smith, D. Oxford: Blackwell. Lehmkuhl, U. (2007) ‘Historicizing Nature: Time and Space in German and American Environmental Historiography’ in U. Lehmkuhl & H. Wellenreuther, (eds), Historians and Nature: Comparative Approaches to Environmental History. The Krefeld Historical Symposia, Oxford: Berg, 17–44. Lepistö, V. (1994) Joko Teillä on primuskeitin? : Kotitalousteknologian saatavuus ja tarjonta Helsingissä 1800-luvun puolivälistä 1910-luvun lopulle. Helsinki: Suomen historiallinen seura. Lütgert, S. A. (2000) Eiskeller, Eiswerke und Kühlhäuser in Schleswig- Holstein und Hamburg: Ein Beitrag zur Kulturlandforschung und Industriearchäologie. Husum: Husum Verlag. Manner, (1936) ‘Porvoon Panimo Oy varustautunut jäähdytyslaitoksella’ Mallasjuomat (12/1936, 364–367). Macnaghten, P. & Urry, J. (1998) Contested natures. London and Thousand Oaks, Calif.: SAGE Publications. Mauch, C. & Zeller, T. (2008) ‘Rivers in history and historiography: An introduction’ in C. Mauch, & T. Zeller, (eds), Rivers in History: Perspectives on waterways in Europe and North America. Pittsburgh: University of Pittsburgh Press, 1-10. Nääppä, J. (1997) ’Jäännostoa Vantaanjoesta’, in Narinkka [Yearbook of the City Museum]. Helsinki: Helsingin kaupunginmuseo, 247-259. Radin, J. & Kowal, E. (2017) ‘Introduction’, in J. Radin & E. Kowal (eds), Cryopolitics; Frozen Life in a Melting World. Cambridge, Mass. and London: MIT Press, 3-26. Rees, J. (2014) Refrigeration Nation: A History of Ice, Appliances, and Enterprise in America. Baltimore: The Johns Hopkins University Press. Rosenberg, E. (2015) ‘Water infrastructure and community building: The case of Marvin Gaye park’, Journal of Urban Design 20(2): 193–211. doi: 10.1080/13574809.2015.1009011. Sarantola-Weiss, M. (2004) ‘Hauskat pienet tavarat: Kodin esinemaailma’, in K. Saarikangas, et al. (eds), Suomen kulttuurihistoria 4: Koti, kylä, kaupunki. Helsinki: Tammi, 338–345. Smedley, S. R. & Wickman, T. (2017) ‘Winter ecology: Insights from biology and history’, Northeastern Naturalist 24(3): ii–viii. doi: 10.1656/045.024.s703. Smith, N. (1984) Uneven Development: Nature, Capital, and the Production of Space. New York and Oxford: Blackwell. Soja, E. W. (1996) Thirdspace: Journeys to Los Angeles and other real-and-imagined places. Cambridge, Mass. : Blackwell. Suomenlinnan jääkellari (2017) ’Mikä jääkellari on?’ Internet-source http://www.jaakellari.fi/?page_id=312 Retrieved 10 January, 2018. Sörlin, S. (2015) ’Cryo-history: Narratives of ice and the emerging arctic humanities’, in B. Evengård, et al. (eds), The New Arctic. Cham: Springer International Publishing, 327–339. Thevenot, R. (1979) A history of refrigeration throughout the world. Paris: IIR. Twilley, N. (2012) ‘The Coldscape’, Cabinet Magazine 47 (Fall Issue). Accessed March 18, 2019. http://www.cabinet magazine.org/issues/47/twilley.php. Urbans, R. & Sovijärvi, S. (1961) Oy Hartwall Ab: Kivennäisvesi- ja virvoitusjuoma-alan uranuurtaja Suomessa: Historiallisia kuvia yhtiön 125-vuotistaipaleelta. Helsinki: Hartwall. W-l. (1933) ‘Stadens is-åker’, Helsingfors journalen 7/1933, pp. 158, 168. Wikman, (1965) ‘Jään nosto kuuluu pian historiaan’, Suomen Sosialidemokraatti (7 March 1965, nro 64, p. 1, 3). Weightman, G. (2003) The Frozen-Water Trade: A True Story. New York: Hyperion.